After a prolonged silence, creative in many respects, the kitchen is now open! 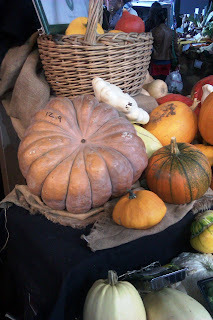 I have much to share with you dear reader, many writings, cooking adventures, photos and thoughts. Researching old and new Greek cookery books throughout the summer turned out to be my rite of passage and transformed me into the person I have always wanted to become: Someone who wakes up and gets out of bed happily looking forward to the day ahead. What does this day entail? You’ll find out soon. The journey has just begun and seems to be filled with new smells and tastes and ideas. My past will always be a part of me and glimpses of my old life still evoke a bittersweet nostalgia. Great love stories never have endings they say. But as the sun rises in the morning I find myself happier than ever. So let’s all welcome autumn and celebrate with, what else: squash! Peculiar colours and shapes brighten the often gloomy London. Borough market last week was full of them and I couldn’t resist buying some, although almost a week after that trip, I am not yet sure how to cook them. They are so beautiful that for the moment I have left them inside the fridge and I am satisfied by just opening the fridge door and staring at them, like one would look at a Kandinsky painting: amazed yet slightly intimidated. So wear your aprons, get your cookery books or browse your favourite recipe websites. 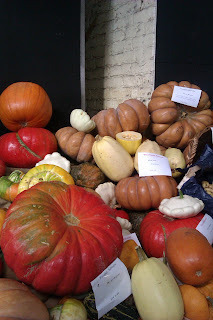 This autumn is going to be “squashy”.